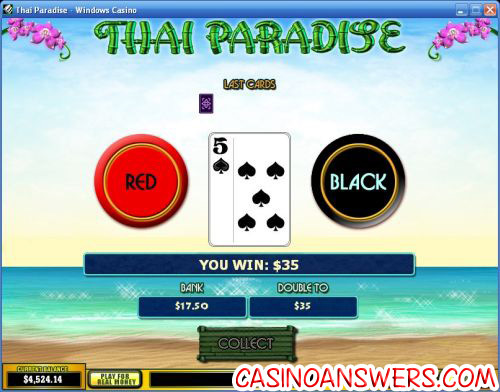 Thai Paradise Video Slot Guide & Review - Casino Answers! Thai Paradise is a 5-reel, 15-line video slot developed by Playtech, featuring a wild symbol, scatter wins, a free spins feature and a gamble feature. You can play the Thai Paradise video slot game at William Hill Casino and Omni Casino. To get started on the Thai Paradise slot machine, set your coin value at $0.01, $0.05, $0.10, $0.25, $0.50, $1 and $2. Then, you can set your line bet at 1-10X your coin value (or 1-10 coins). You can also modify the number of paylines (from 15). The lowest total bet you can play on Thai Paradise is a penny and the highest total bet is $300 per spin. To play 10 coins and all 15 lines, hit “Bet Max.” For other wagers, use the Spin button. An interesting symbol on the Thai Paradise is the Orchid symbol. It is the wild symbol, meaning it will substitute for all symbols in the game. It is also the scatter symbol, it doesn’t have to appear on an active payline to pay out and your payouts will be multiplied by the total bet. It pays out 2X for 3 symbols, 20X for 4 symbols and 200X your total bet for 5 symbols. If you hit 3 or more Orchid symbols, you will win 10 free spins with an additional mystery scatter symbol. The mystery scatter is chosen randomly out of any of the regular symbols, except the Orchid symbol. Once chosen, the mystery scatter adopts scatter-type behaviour. More free spins can be won during the free spins feature infinitely. The top jackpot symbol on the Thai Paradise video slot is the Thai Girl. 5 Thai Girl symbols on an active payline will win you the 5000 coin top jackpot. 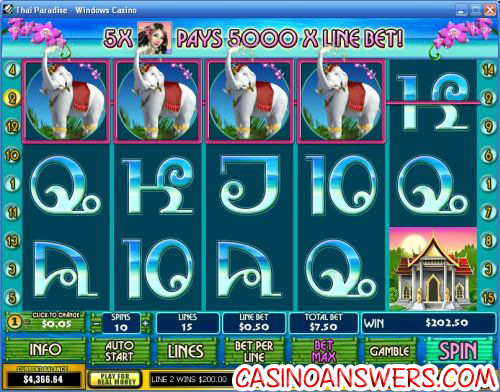 The Elephant symbol is another big payout – 5 Elephants will pay 2000X your line bet. After any win of the Thai Paradise slot game, you can hit the “gamble” button to double your winnings. In the gamble feature, you will have a facedown card. You must guess whether the card will come up red or black. If you guess correctly, you will win double your winnings. Get it wrong and you will forfeit your winnings. You can exit the gamble feature using the “Collect” button. You can play up to the double up limit of $750 at William Hill Casino. Other features on Thai Paradise include an autoplay mode where you can play up to 99 autoplay spins. You can cancel autoplay at any time. Another feature available is “skill stop” where you can stop the reels at any time during a spin. Thai Paradise scores highly for presentation, which is something you can expect from a Playtech video slot. The free games feature with the mystery scatter is a great feature can also lead to some big winnings. To play the Thai Paradise video slot, visit William Hill Casino! Where can I find other Thai-themed slot games? For more Thai video slots, you can read our Bangkok Nights Video Slot Review that you can play at the US-friendly Crazy Slots Casino or you can also read our Thai Sunrise Video Slot Review that you can find at InterCasino. Where can I play a Flash game of the Thai Paradise slot machine for free? You can find the Instant Play version of Thai Paradise at William Hill Flash Casino and Omni Flash Casino. You can play the Thai Paradise Flash slot game for free or real money. If you experience issues playing the Thai Paradise Flash game, try downloading the latest version of Adobe Flash Player. If I’m based in the United States, can I play the Thai Paradise slot game? Unfortunately, American players are unable to play Thai Paradise at Playtech online casinos. However, you can still play the Bangkok Nights Video Slot at US-friendly Vegas Tech casinos such as English Harbour Casino. What paradise slot machines are there?